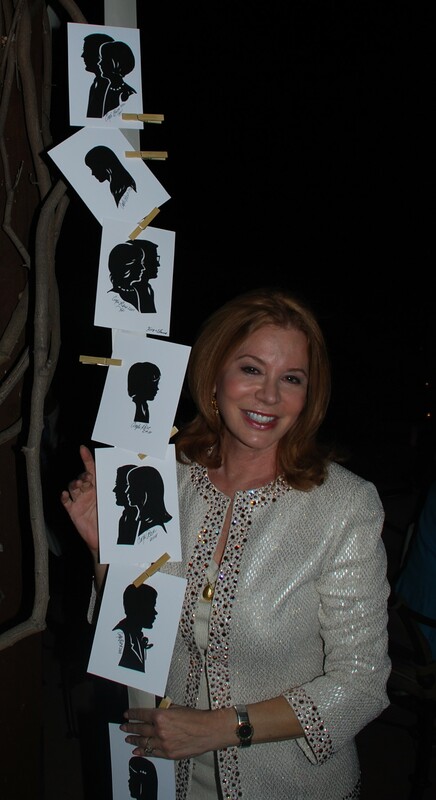 Imagine at your wedding, having master silhouette artist, Cindi Harwood Rose in person to hand profile your guests silhouettes, and sign them as treasured gifts to take home. This is what happened at the recent California wedding of book author, Lisa (now Joiner) and mayor of Lincoln, CA Paul Joiner’s wedding. Rose, who has snipped heirloom portraits all over the world, flew into California for this occasion. 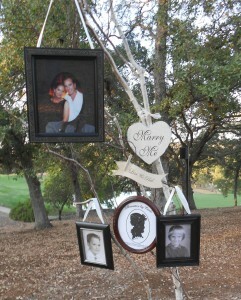 She cut two silhouettes of each person, one for the guest, which were hung on ribbons from trees with clothes pins, and one was placed in the guest book, and signed by each guest for the bride and groom to cherish for life. 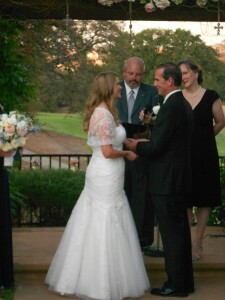 The bride, changed into a casual outfit (as shown in this picture) and wore a silhouette pendant that Cindi Rose gifted her with. 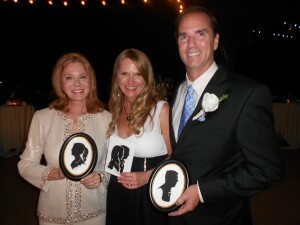 Read more about Lisa and Paul’s silhouette wedding here: Wedding Style Silhouette So-Cool! The silhouette theme at wedding is so chic and modern. It can be taken to be the entire theme. Famed silhouette artist, C. Harwood Rose, has ordered bride and groom silhouette mugs, lip gloss, plates, necklace’s, napkins, and yes, centerpieces. 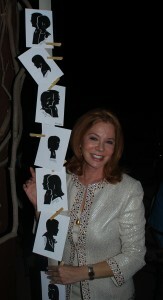 Upon booking her you receive your silhouettes facing one another. This you can use on invitations, and place upon the back of your chairs. 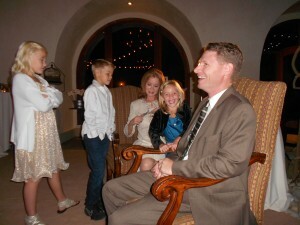 At the wedding, Cindi Rose will silhouette the bride and groom together, with veil, and wardrobe. Cindi says it is not good luck to do this ahead of time. Not until your wedding day, should the engaged couple be shown in wedding attire. 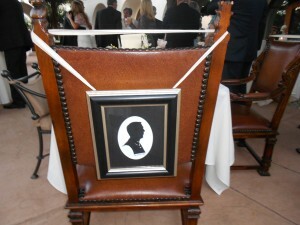 The silhouette is fabulous décor, and always makes a statement in any venue. Rarely, is it hand-cut with full details as Harwood-Rose does. That art is a lost art. Most silhouette artist, trace from walls, use a light, a camera, or photoshop. Some can’t do interior details, get a likeness, or group individuals together. Let alone cut fast. Cindi Harwood Rose is the world’s fastest silhouette artist, and her work, is smooth, with personality, and style. Read more of Cindi’s tips on having your own successful silhouette wedding here: Seven “S’s” for a Successful Silhouette Wedding. The art magazine, Origin Magazine, says that Cindi Harwood Rose is America’s best silhouette artist, the Edourt of modern times. bridal silhouettes, Cindi Harwood Rose, Cindi Rose silhouettes for survivors, Erica Rose, fastest, Fine Art, great cut-arts, greatest, historic, museum-quality, paper profile portraits, premier silhouette artists, Rose Ribbon Foundation, silhouettes by Cindi, Victorian silhouettes, wedding silhouettes, World’s best America’s premier. Bookmark.